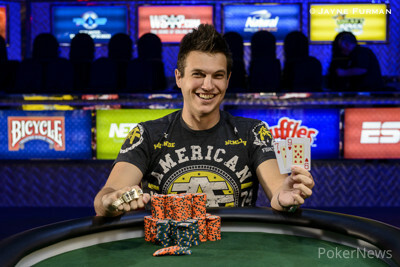 Doug Polk won Event #23: $1,000 Turbo No-Limit Hold'em, a World Series of Poker gold bracelet, and $251,969. 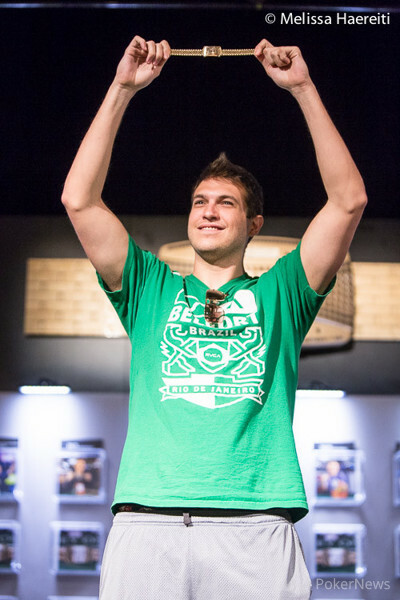 Polk, perhaps better known as “WCGRider” in the online world, defeated 1,472 runners to claim his first WSOP title. Polk defeated Andy Philachack heads-up to claim the title. 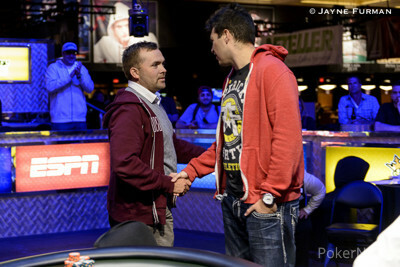 On Hand #109, Polk raised to 120,000 and Philachack called from the big blind. The flop came and both players checked. The turn was the and Polk bet 155,000 after Philachack checked. Philachack made a minimum raise and Polk made the call. The river was the and Philachack moved all in. Doug Polk snap-called while standing up, tabling a straight with . A dejected Philachack turned over for turned trip threes, and his tourney run ended in second place. The final table was headlined by The End Boss, Anthony Gregg. Gregg was eliminated on the 16th hand in sixth place by Andy Philachack. Gregg raised from under the gun to 40,000 leaving himself with just 5,000 behind. Philachack made the call from the button and Chad Cox called from the big blind. The flop came , Cox and Gregg checked to Philachack who bet 50,000. Cox folded and Gregg put the last of his chips in with , which was well behind Philachack's . Gregg would pick up some hope with the on the turn, but the river would not be the club he needed, and Gregg was eliminated in sixth place for $40,168. The eliminations came swift and hard as Andrew Mackenzie (9th Place - $17,857), Dash Dudley (8th Place - $23,093), Gianluca Cedolia (7th Place - $30,252) and Gregg were all busted within the first 16 hands. Liam Alcock was the next to go in fifth place earning $54,088. Chad Cox busted in fourth place taking home $73,894, and Jonathan Hanner was the third-place finisher, walking away with $102,503. Notables making the money were Amanda Baker, who bubbled the final table, Rhys Jones, Nam Le, Christophe De Meulder, Erik Cajelais, Dan Harrington, Jonas Mackoff, Justin Zaki, Griffin Benger, Scott Montgomery, Ryan Riess and Aaron Steury. The fastest event of the series drew a large field of professionals who could not make the money, including Liv Boeree, Greg Raymer, Loni Harwood, Moshin Charania, Tony Dunst, Vanessa Selbst, Allen Cunnigham, Jonathan Roy, Xuan Liu, Sorel Mizzi, Jason Duval, Ryan Hall, Mark Radoja, Joseph Cheong, Olivier Busquet, Brandon Cantu, Phil Laak, Will Failla and Scott Clements. Thank you for following along with PokerNews. Stay tuned for live updates throughout the rest of the 2014 World Series of Poker. Hand #108: Doug Polk received a walk in the big blind. Hand #109: Polk raised to 120,000 and Philachack called from the big blind. The flop came and both players checked. The turn was the and Polk bet 155,000 after Philachack checked. Philachack made a minimum raise and Polk made the call. The river was the and Philachack moved all in. Doug Polk snap-called while standing up, tabling a straight with . A dejected Philachack turned over for turned trip threes. Philachack was eliminated in 2nd place and Polk is our winner! Hand #104: Philachack opened to 130,000, Polk shoved all-in, and Philachack folded. Hand #105: Polk opened and took it down. Hand #106: Philachack opened to 130,000 and Polk made the call. The flop came and both players checked to the on the turn. Philachack bet 200,000 and Polk folded. Hand #107: Polk open-shoved; Philachack folded. Hand #98: Philachack opened to 130,000. Polk called from the big blind. The flop came and both players checked. 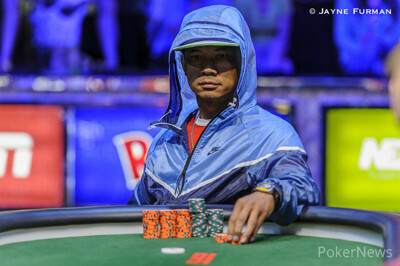 The turn was the , and Polk would take the pot when Philachack folded to his 145,000 chip bet. Hand #99: Polk opened to 125,000 and took down the blinds and antes when Philachack folded. Hand #100: Philachack opened to 130,000 and Polk called from the big blind. The flop came and both players checked. The turn was the and Polk called Philachack's 150,000 bet. Both players would check the river. Philachack would take it down with a rivered pair of tens when he showed . Hand #101: Polk opened for 120,000 and Philachack called. The flop came . Polk bet 160,000 and took down the pot when Philachack folded. Hand #102: Philachack completed the small blind and Polk checked his option. They both checked the flop. Polk bet 90,000 on the turn and Philachack folded. Hand #95: Doug Polk opened to 125,000 and Andy Philachack called. The dealer fanned a flop of and both players checked to the turn . Philachack check-called a155,000 bet from Polk, and the two seen a river . Philachack checked, Polk bet 410,000 and Philachack folded. Hand #96: Polk got a walk. Hand #97: Polk raised to 125,000 and Philachack shoved all in. Polk called. Philachack was way behind and needed some help from the board. The dealer laid out and Philachack caught one of seven outs on the river to score the double up. Hand #91: Doug Polk opened to 105,000 and Andy Philachack raised it to 250,000. Polk called. The flop came and Philachack led out for 300,000 and Polk called. The turn was the and Philachack took a little time before he placed a bet of 400,000 into the middle. Polk called. The river was the putting three sevens on the board. Philachack looked across the table carefully at Polk, leaned back in his chair slightly and then checked. Polk quickly checked behind and would take down the pot when his was one notch better than Philachack's . Hand #92: Philachack opened for 150,000 and Polk folded. Hand #93: Blinds moved up to 30,000/60,000 with a 10,000 ante. Polk opened to 125,000, Philacheck insta-shoved and Polk folded just as quickly. Hand #94: Polk received a walk in the big blind. Hand #90: Andy Philachack opened for 100,000 and Jonathan Hanner moved all in for approximately 500,000 total. Philachack stood up, perched himself on his knees in his chair. After some profound thought, he made the call. The flop was a monster for Philachack, as it came to give him middle pair with a flush draw. The turn was the and Hanner would need the or to stay alive. The river gave Philachack a flush - the - and Hanner was eliminated in third place. Doug Polk enters heads-up play with a slight chip lead over Philachack. Doug Polk and Tony Gregg Headline Turbo Final Table; Action Starts at 1 p.m.